Trichoderma spp. are fungi that are present in nearly all soils and other diverse habitats. In soil, they frequently are the most prevalent culturable fungi. Fig. 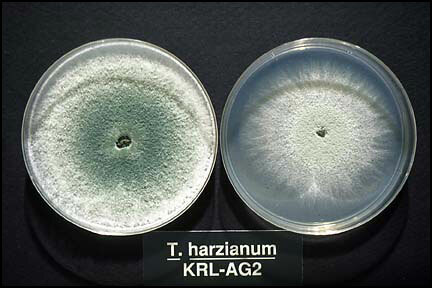 1: Cultures of Trichoderma harzianum strain T-22 (KRL-AG2) growing on potato dextrose agar. The white areas do not contain spores, while the green areas are covered with dense masses of spores (conidia). They are favored by the presence of high levels of plant roots, which they colonize readily. 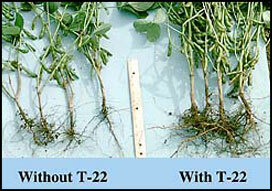 Some strains are highly rhizosphere competent, i.e., able to colonize and grow on roots as they develop. The most strongly rhizosphere competent strains can be added to soil or seeds by any method. Once they come into contact with roots, they colonize the root surface or cortex, depending on the strain. Thus, if added as a seed treatment, the best strains will colonize root surfaces even when roots a meter or more below the soil surface and they can persist at useful numbers up to 18 months after application. However, most strains lack this ability. Fig. 3: Colonization of root hairs of corn by the highly rhizosphere competent strain of T. harzianum T22. Used with permission of the American Phytopathological Society (Harman. 2000. Plant Disease 84:377-393). In addition to colonizing roots, Trichoderma spp. attack, parasitize and otherwise gain nutrition from other fungi. Since Trichoderma spp. grow and proliferate best when there are abundant healthy roots, they have evolved numerous mechanisms for both attack of other fungi and for enhancing plant and root growth. Several new general methods for both biocontrol and for causing enhancement of plant growth have recently been demonstrated and it is now clear that there must be hundreds of separate genes and gene products involved in these processes. A recent list of mechanisms follows. 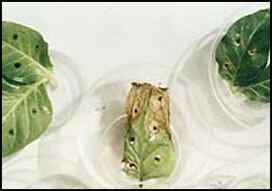 Most Trichoderma strains have no sexual stage but instead produce only asexual spores. However, for a few strains the sexual stage is known, but not among strains that have usually been considered for biocontrol purposes. The sexual stage, when found, is within the Ascomycetes in the genus Hypocrea. Traditional taxonomy was based upon differences in morphology, primarily of the asexual sporulation apparatus, but more molecular approaches are now being used. Consequently, the taxa recently have gone from nine to at least thirty-three species. Most strains are highly adapted to an asexual life cycle. In the absence of meiosis, chromosome plasticity is the norm, and different strains have different numbers and sizes of chromosomes. Most cells have numerous nuclei, with some vegetative cells possessing more than 100. Various asexual genetic factors, such as parasexual recombination, mutation and other processes contribute to variation between nuclei in a single organism (thallus). Thus, the fungi are highly adaptable and evolve rapidly. There is great diversity in the genotype and phenotype of wild strains. While wild strains are highly adaptable and may be heterokaryotic (contain nuclei of dissimilar genotype within a single organism) (and hence highly variable), strains used for biocontrol in commercial agriculture are, or should be, homokaryotic (nuclei are all genetically similar or identical). This, coupled with tight control of variation through genetic drift, allows these commercial strains to be genetically distinct and nonvariable. This is an extremely important quality control item for any company wishing to commercialize these organisms. So far as the author is aware, different strains of Trichoderma control every pathogenic fungus for which control has been sought. However, most Trichoderma strains are more efficient for control of some pathogens than others, and may be largely ineffective against some fungi. The recent discovery in several labs that some strains induce plants to "turn on" their native defense mechanisms offers the likelihood that these strains also will control pathogens other than fungi. Fungal thalli are shown in the figure at the beginning of this web page. 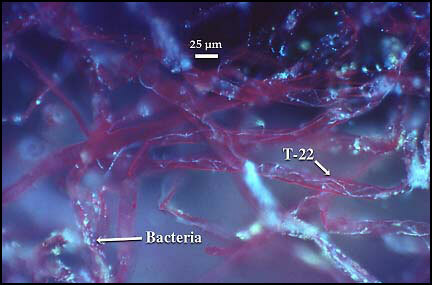 The organism grows and ramifies as typical fungal hyphae, 5 to 10 µm in diameter. Asexual sporulation occurs as single-celled, usually green, conidia (typically 3 to 5 µm in diameter) that are released in large numbers. Intercalary resting chlamydospores are also formed, these also are single celled, although two or more chlamydospores may be fused together. Trichoderma spp. are highly efficient producers of many extracellular enzymes. They are used commercially for production of cellulases and other enzymes that degrade complex polysaccharides. They are frequently used in the food and textile industries for these purposes. For example, cellulases from these fungi are used in "biostoning" of denim fabrics to give rise to the soft, whitened fabric--stone-washed denim. The enzymes are also used in poultry feed to increase the digestibility of hemicelluloses from barley or other crops. As noted, these fungi are used, with or without legal registration, for the control of plant diseases. There are several reputable companies that manufacture government registered products. Some of these companies are listed at the end of this web page. This site will not knowingly list any nonregistered products or strains offered for sale in commercial agriculture even though these products are common and their sale is widely ignored by governmental regulatory agencies. For many years, the ability of these fungi to increase the rate of plant growth and development, including, especially, their ability to cause the production of more robust roots has been known. The mechanisms for these abilities are only just now becoming known. Some of these abilities are likely to be quite profound. Recently, we have found that one strain increases the numbers of even deep roots (at as much as a meter below the soil surface). These deep roots cause crops, such as corn, and ornamental plants, such as turfgrass, to become more resistant to drought. 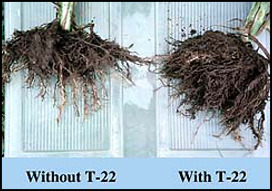 Perhaps even more importantly, our recent research indicates that corn whose roots are colonized by Trichoderma strain T-22 require about 40% less nitrogen fertilizer than corn whose roots lack the fungus. Since nitrogen fertilizer use is likely to be curtailed by federal mandate to minimize damage to estuaries and other oceanic environment (there are a number of other sites on the web dealing with this topic, search for sites dealing with the ‘dead zone’) the use of this organism may provide a method for farmers to retain high agricultural productivity while still meeting new regulations likely to be imposed. Fig. 4: Enhanced root development from field-grown corn and soybean plants as a consequence of root colonization by the rhizosphere competent strain T. harzianum T22. Enhanced root development probably is caused by a combination of several of the mechanisms noted above. Fig. 5: Improved survival of pepper plants in the field as a consequence of better root development caused by growth of seedlings in the greenhouse in the presence of T22. 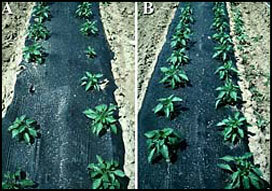 The yield of the first picking of peppers was improved as a consequence, as shown. As a source of transgenes. Biocontrol microbes, almost by definition, must contain a large number of genes that encode products that permit biocontrol to occur. Several genes have been cloned from Trichoderma spp. that offer great promise as transgenes to produce crops that are resistant to plant diseases. No such genes are yet commercially available, but a number are in development. These genes, which are contained in Trichoderma spp. and many other beneficial microbes, are the basis for much of "natural" organic crop protection and production. Fig. 6: Some biocontrol genes from T. harzianum have been inserted into plants, where they provide resistance to several diseases. 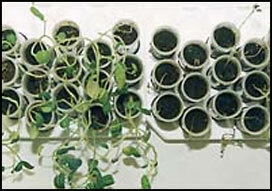 Tobacco and potatoes, shown in this figure, were transformed to express the fungal endochitinase gene, which resulted in high levels of resistance to Alternaria alternata (tobacco) and Rhizoctonia solani (potato). Data are from Lorito et al. 1998. Proc. Am. Acad. Sci. USA 95:7860-7865. There are a number of references that provide a wealth of information about these fungi. Some of these are listed below. Kubicek, C. P. and Harman, G. E. 1998. Trichoderma and Gliocladium. Vol. 1. Basic Biology, Taxonomy and Genetics, Taylor & Francis, London. 278 pg. Harman, G. E. and Kubicek, C. P. 1998. Trichoderma and Gliocladium, Vol. 2, Enzymes, Biological Control and Commercial Applications. Taylor & Francis, London. 393 pg. The preceding two multi-author books contain most pertinent information on these fungi known through 1997. They can be purchased on the Amazon.com web site. The following books contain substantial amounts of information regarding biocontrol with Trichoderma, and also include information on other topics. Chet. I. 1987. 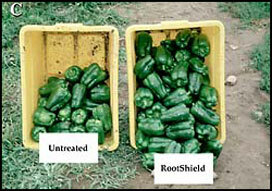 Innovative Approaches to Plant Disease Control. Wiley-Interscience, New York, 372 pg. Lumsden, R. D. and Vaughn, J. L. 1993. Pest Management: Biologically Based Technologies. Am. Chem. Soc., 435 pg. Altomare, C., Norvell, W. A., Björkman, T., and Harman, G. E. 1999. Solubilization of phosphates and micronutrients by the plant-growth promoting and biocontrol fungus Trichoderma harzianum Rifai 1295-22. Appl. Env. Microbiol. 65:2926-2933. Elad, Y., and Kapat, A. 1999. The role of Trichoderma harzianum protease in the biocontrol of Botrytis cinerea. Eur. J. Plant Pathol. 105:177-189. Howell, C. R., Hanson, L. E., Stipanovic, R. D., and Puckhaber, L. S. 2000. Induction of terpenoid synthesis in cotton roots and control of Rhizoctonia solani by seed treatment with Trichoderma virens. Phytopathology 90:248-252. Yedidia, I., Benhamou, N., and Chet, I. 1999. Induction of defense responses in cucumber plants (Cucumis sativus L.) by the biocontrol agent Trichoderma harzianum. Appl. Environ. Microbiol. 65:1061-1070. Harman, G. E. 2000. The myths and dogmas of biocontrol: changes in perceptions derived from research on Trichoderma harzianum strain T-22. Plant Disease 84 (in press, will be published in the April issue). Bolar, J., Norelli, J. L., Wong, K.-W., Hayes, C. K., Harman, G. E., and Aldwinckle, H. S. 2000. Increased resistance to scab of endochitinase transgenic McIntosh apple lines. Phytopathology 90: 72-77. Lorito, M., Woo, S. L., Garcia Fernandez, I., Colucci, G., Harman, G. E., Pintor-Toro, J. A., Filippone, E., Mucciflora, S., Lawrence, C. B., Zoina, A., Tuzun, S., and Scala, F. 1998. Genes from mycoparasitic fungi as a source for improving plant resistance to fungal pathogens. Proc. Natl. Acad. Sci, USA 95:7860-7865. Companies with registered biocontrol products, or who are developing biocontrol products or uses, are encouraged to contact the web master in order to become listed. However, this site will not knowingly list an address for any company that sells any Trichoderma-based product for biocontrol or plant growth promotion that has not undergone governmental review for safety, efficacy or other required evaluations and that therefore sells a non-registered product(s). Academic or private laboratories or other research organizations with web sites are encouraged to contact the web master in order to become listed at this site. Edited by WolfWhiz, 14 April 2019 - 05:14 AM.